For signed, personalized copies, contact John Dozier via email. Prices will vary slightly. Quantity discounts available. NEW! 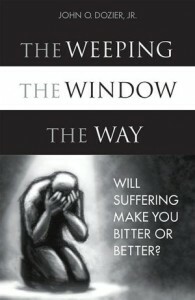 “The Weeping, the Window, the Way” IN COMMUNITY. A highly focused, abbreviated, and user-friendly form of using the book, within the context of a COMMUNITY (BIBLE STUDY, FELLOWSHIP) GROUP setting.